Lenoir has recently teamed up with Hickory, NC and created a catchy new slogan for the campaign. What is it? Gotta Get a Gigabit. Try and say that five times fast. What could landing this project mean? Well it would be a huge boost to the local economy that has been hit harder than most due to the predominantly furniture manufacturing base. Companies from all over would want to move to the area in order to take advantage of the insanely fast Gigabit data speeds. Among those that would benefit most would be; Web Firms, Web Hosting Datacenters like ThePlanet.com (largest server/hosting company in the world), as well as new media companies that deal with Video and other high bandwidth needs. 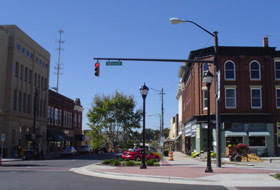 Will Lenoir, NC get the new project? Only time will tell. Stay tuned, we plan to post more on the the town in weeks to come, and will surely be one of the first to post on the new Gigabit project. Thanks for reading, be sure to bookmark us and tell your friends. All comments welcome! This entry was tagged dan gilbert city manager, dan gilbert lenoir, dan gilbert nc, dan gilbert nc city manager, danny gilbert, danny gilbert city manager, danny gilbert nc, gig to the home, gilbert danny lenoir, google datacenter in lenoir, google datacenter nc, google in lenoir, Google lands in Lenoir, google lenoir nc, google lenoir nc jobs, gotta get a gigabit, gotta get a gigabyte, hickory lenoir google, lenoir, lenoir city council, lenoir danny gilbert, Lenoir Data Center, lenoir nc, lenoir nc assistant city manager, lenoir nc city manager, lenoir nc datacenter, lenoir nc jobs, nc, nc danny gilbert by pagestat. Bookmark the permalink.